The Food and Agriculture Organisation (FAO) of the United Nations (UN), with its HQ in Rome, exists to ‘spearhead international efforts to defeat hunger and build a food-secure world for present and future generations’. Last week I recorded a podcast with Ian Meldon, a records management consultant working for the FAO, in which Ian described the approach of FAO to implementing a records management system based around e-mail. providing colleagues with ways of keeping abreast of the work e-mail traffic of team-mates, without those team mates having to copy each other into those e-mails. From the year 2000 FAO had asked colleagues to copy or forward any e-mail needed as a record to the e-mail address of their local registry, where registry staff would file the e-mail in a Microsoft Outlook shared folder structure. The system worked tolerably well, although compliance with the policy varied from area to area. One weakness of the previous system was that all the records were kept within the Microsoft Exchange environment. People could only see the records of their local area – there was no possibility of a FAO wide search. There was no sustainable way of holding and applying retention rules to the records. Don’t appear to introduce a yet another computer system FAO have procured and implemented a robust electronic records management system (Filenet from IBM), for use as their repository. But end-users never need interact directly with the Filenet repository – everything they need to do on the system can be done through the Outlook e-mail client. Don’t ask people to do something they are not already doing The idea was not to ask users to do anything more time consuming than the previous system’s demand that they copy in the registry to significant e-mails. Under the new system every time a colleague sends an e-mail, a records capture pop-up appears asking them to say whether the e-mail is either a) personal or trivial or b) draft/transitory or c) FAO record. If an individual selects personal or trivial then the e-mail is sent without going into the records repository. 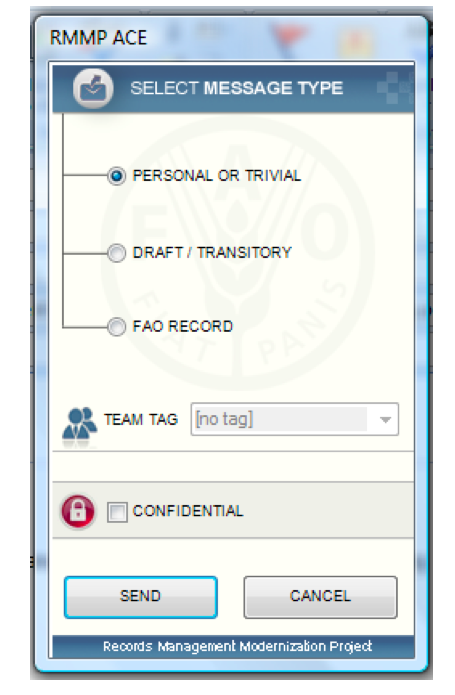 If the individual selects either draft/transitory or FAO record then they are asked to choose the appropriate ‘team tag’ for the message (the team tag denotes which team they were working for in sending the message). The message then gets sent and a copy is placed in the records repository. There is also the opportunity to mark a message as confidential if it is work related but there is a need to restrict access to it. Provide something useful beyond the need to keep records At 10pm every night the system generates a ‘digest’ for each team tag. The digest is an e-mail that lists and links to all the FAO Record e-mails sent that day and tagged with that team tag. This means that each morning an individual can see at a glance all the significant e-mails sent by colleagues in their team the previous day. This has reduced the need for colleagues to ‘copy each other in’ to e-mails. Furthermore individuals can choose to receive digests from other teams (if they have appropriate permissions). If a manager oversees six or seven teams they can look at the digest for the six or seven team tags each morning, without needing to be copied into hundreds of e-mails. 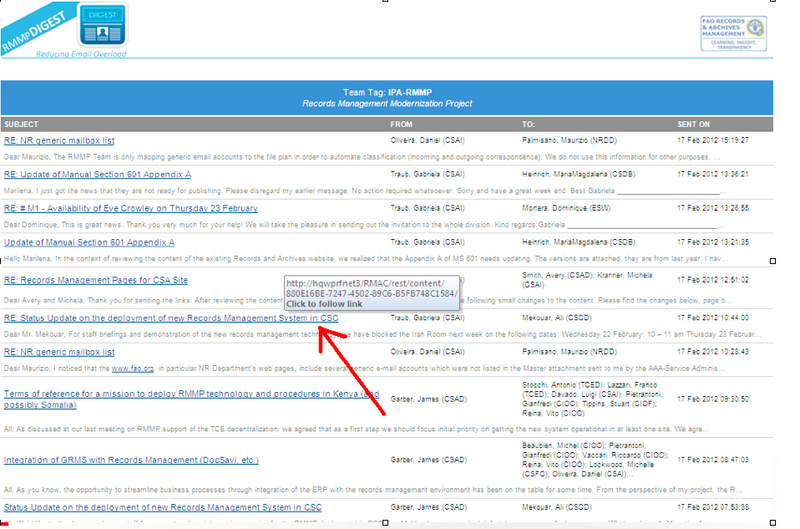 The illustration above shows the team tag digest e-mail generated by the records system for the team tag ‘IPA-RMMP (the Records Management Modernisation Project) on 17 February 2012. Members of the team, plus anyone who had decided to subscribe to that team tag, would have received that digest late on the 17 February. It gives them the subject line and first line of each e-mail. It is presented in reverse-chronological order by time sent. The digest is simply an automatically generated search query. Any colleague can search the records repository from their Outlook client and generate a similar report, showing the FAO Record e-mails of any team over any time period, provided only that they have appropriate permissions for that team tag. FAO created team tags by simply asking every area of the organisation to identify what teams they had, and who worked in those teams. Team tags are maintained by registry/records management staff who create new team tags when new teams or project teams emerge, assign individuals to membership of particular team tags, and maintain the access permissions around team tags. An individual might belong to one, two or several teams. When they send an e-mail from the Outlook client the records capture pop-up asks them to assign a team tag to it if they have marked it as draft/transitory or FAO record. The pop-up presents them with a drop-down list of the teams they are assigned to. If the individual is assigned to only one team then they have no choice to make – the team tag will be filled in automatically. FAO created a records classification based on a functional analysis of the activities of their organisation. The challenge was how to apply the records classification to the records that would build up in the system. If FAO had asked individual users to place each e-mail into a file within that records classification then it would have broken their principle of not asking people to do something they were not already doing (in FAO’s previous system registry staff had placed e-mails on files on behalf of end-users). The first approach FAO trialled was auto-classifcation, where an auto-classification tool would allocate e-mails declared as Draft/transitory and FAO Record to the appropriate functional classification. Daniel Oliveira who worked on the project with Ian, told me that the auto classification worked amazingly well in areas such as the finance where the subject of messages were relatively consistent and predictable, but it did not work nearly as well in the policy areas where the subjects of messages were unpredictable and unrepeated. Policy work constitutes a significant proportion of FAO’s work. The approach they settled on was simply to map the team tags into the functional records classification. Each team tag is linked to one node in the records classification. FAO are building up in their repository what is in effect a correspondence record for each team, sortable by sender, recipient and date. Each of these correspondence records is linked to the functional records classification, from which it can inherit a retention rule. To my eyes they have struck a neat balance between the strongly individual centric nature of e-mail as it has emerged over the past two decades, and the more collective tradition of files and record keeping. E-mail saved as ‘draft/transitory‘ and ‘FAO Record‘ enters the records repository (FileNet) and inherits its access permission from the team tag, unless it had also been marked as Confidential. FAO encourages teams wherever possible/appropriate to authorise all FAO staff to access the e-mails tagged with their team tag. Teams are able to set a different access permission for ”draft/transitory‘ than for ‘FAO Record‘ if they wish to make a distinction. 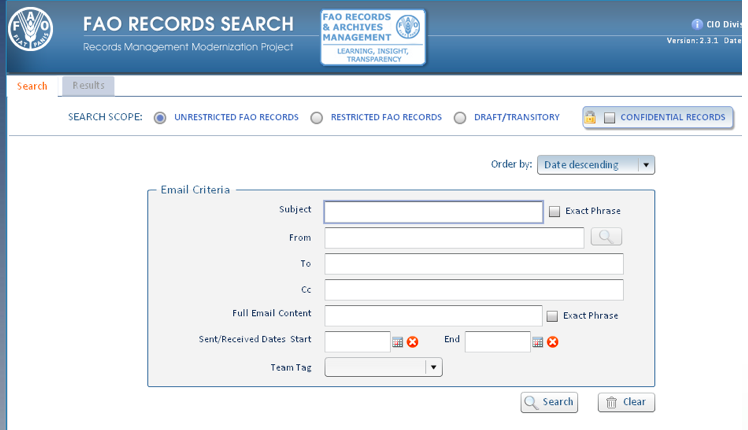 When FAO colleagues go to send an e-mail, a records capture pop-up intervenes to prompt them to capture the e-mail to the records repository if it has some significance. However when colleagues receive an e-mail there is no such opportunity to intervene with a pop-up. There is a trend for colleagues to access e-mail via mobile devices such as smartphones and tablets. These devices do not have the extended Outlook client with the FAO records capture pop up. There are too many varieties of smartphones/tablets out there for it be feasible for FAO to develop a customised e-mail client for each device. FAO have given staff a generic e-mail address that they can copy e-mails sent from their mobile devices into. Staff working in the Registries capture those e-mails into the system and give them the appropriate team tag. The search facility for the records system is built into the Outlook e-mail client. To my eyes the search looks more intuitive than the advanced search in a typical electronic records management system. This is because the metadata of e-mail (from/to/cc/subject/date) is simpler, more standardised and more intuitive than the metadata collected from end users in document profiles by electronic management systems. Their approach does not depend on any particular proprietary software. They have used a proprietary electronic records management system as their repository for the e-mail, but they could have used any one of a number of different electronic records management systems and achieved similar results. The customisation of the e-mail environment was done by their in-house development team. Their approach does not depend on clever algorithms or sophisticated auto-classification rule engines. They have moved away from files and filing, but still group records into meaningful and manageable aggregations Records are accumulating in manageable aggregations, but these aggregations are slightly different from files we have been used to in old paper filing systems, and the files that we created in electronic document and records management systems. Those files attempted to capture the whole story of each particular piece of work. They depended on teams setting up a new file for every new piece of work that they started. The nearest equivalent of the file in the FAO set up is the team tag. But teams have not been required to create/request a new team tag every time they start a new piece of work – they keep the same team tag for all the work they undertake. The record is in effect a correspondence record of that particular team over a particular time. This is less granular than a traditional file structure. But the loss of granularity is compensated for by the ability to sort on sender/recipient and date.